Singles Knock-out winner - William Atkinson. Heaviest fish - William Atkinson - 13 lb 12½ oz - Wednesday 3rd October 1979. Heaviest fish caught out of competition - Paddy Hoy - 9 lb 11 oz & Sandsend Trophy. Christmas match winner - Dave Perrett - 19 lb 11 oz. 1st - Andrew Spilman - 23 lb 11½ oz - Argyle Trophy. 2nd - Howard Fields - 16 lb 07 oz - Plaque. 3rd - S Hodgkinson - 12 lb 05½ oz - Miniature Trophy. Total weight for the season - lb oz. Whitby Sea Anglers Association held an open competition on Sunday with the weigh-in at the Spa ballroom. It was their first open competition for more than 15 years. The chairman, Mr W Atkinson, welcomed anglers at the presentation and said 17 had weighed in out of an entry of 102. He introduced Captain Denis Cooper, who presented the prizes and said he hoped it would become an annual event. Mr Norman Porritt, of Whitby Angling Supplies, was weigh-man. 1 - £50 and Townsman's Association Angling Trophy, C Webster, Scarborough - 11 lb 08 oz. 17 - F Baxter, Redcar - 08 oz. The heaviest cod, weighing 9 lb 11 oz, and caught by Patrick Hoy at Saltwick Bay, won the sweep. 1980 - Courtesy of William Atkinson, Chairman of Whitby Sea Anglers Association, from his personal collection of press cuttings. Thanks also to the Whitby Gazette. Posted 18/02/2013 PDH. Whitby Sea Anglers Association held their annual winner and presentations at the Lion Inn, Blakey, when 44 members and friends were present. A disco provided the music for dancing. 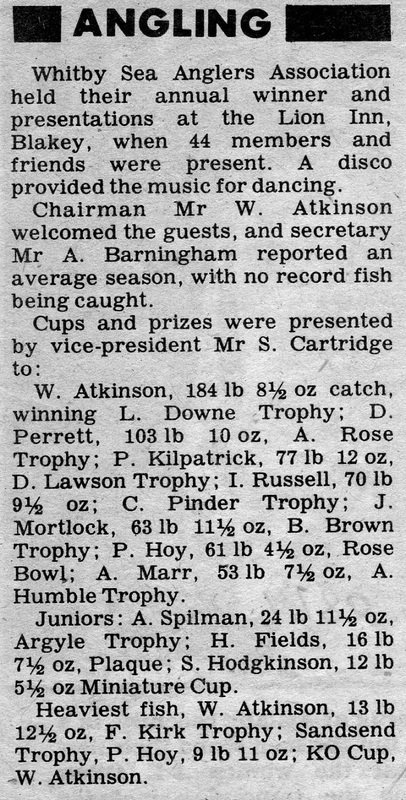 Chairman Mr W Atkinson welcomed the guests, and secretary Mr A Barningham reported am average season, with no record fish being caught. 7 - A Marr - 53 lb 07½ oz, A Humble Trophy. Sandsend Trophy, P Hoy - 9 lb 11 oz. Dave Perrett says this was a night match and there was not a separate prize for Heaviest Fish. The ledger is unclear as to whose name four rows are assigned to and therefore shows two names. William Atkinson 1st (personal records) NEW CLUB RECORD. October - 21 lb 06½ oz. November - 9 lb 03½ oz. December - 45 lb 11 oz. January - 58 lb 11 oz. February - 17 lb 14 oz. March - 30 lb 07½ oz. Total weigh-in 184 lb 06½ oz.